Wings & Wheels Expo 2001 -- B-17G Flying Fortress "Yankee Lady"
Boeing B-17-G-110-VE Flying Fortress "Yankee Lady"
Over the years the Yankee Air Force has been quietly building a collection of vintage aircraft, but their most impressive achievement is the complete restoration of this B-17G. Accepted by the USAAF on July 16, 1945 from Vega, CA, the aircraft was flown to the mod center at Dallas and cleared for service on August 28. Since the war ended just a few days later, the craft was flown to a storage facility in South Plains, TX. The USCG picked up this plane for conversion and the aircraft was flown to Rome, NY on January 20, 1946. Given the US Navy designation PB-1G and BuNo 77255, the plane was modified at NAS Johnsville, PA and accepted by the USCG on February 1, 1946. With radar installed instead of the chin turret and a life boat installed under the bomb bay, the aircraft was used for a variety of missions before being put up for sale by auction on May 11, 1959 and purchased by Ace Smelting for $5,887.73. Registered N3193G, the plane was sold to Fairchild Aerial Surveys in Los Angeles and extensively modified for high altitude camera work. Fairchild flew the plane for five years before selling the craft to Aero Services. However that company only kept the plane for three months before selling it to the Blegert Brothers on October 1, 1965. Modified as a sprayer, the aircraft was sold to Aircraft Specialties on March 19, 1966 and converted to a fire bomber, and also appeared the film "Tora! Tora! Tora!. After years as a faithful tanker, the aircraft was put up for auction again in October 1985, but failed to reach the minimum bid. 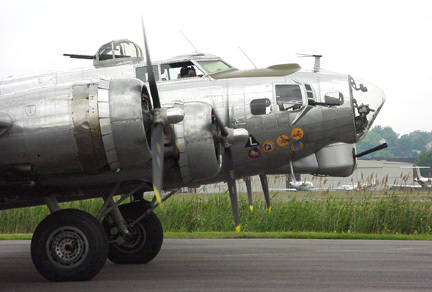 Nine months later it was sold the Yankee Airforce and flown back to their home base in Belleville, MI to begin a 5-year period of restoration. Brig. Gen. Frederick W. Castle of Mountain Lakes, NJ was given command of the 4th combat wing of the 8th Air Force in April 1944. He led a bombing mission of 2,000 B-17th's against Von Rundstedt's ground forces during the Battle of the Bulge. 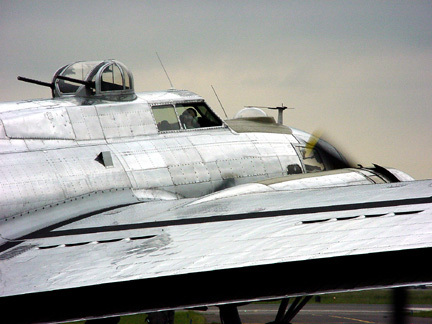 General Castle's B-17 was attacked and severely damaged. He kept his plane under control long enough to allow his crew to parachute to safety, but additional damage and loss of altitude prevented him from jumping. He posthumously received the Congressional Medal of Honor for bravery and sacrifice.